Not satisfied with neither being one of the most sought-after auto brands nor its stylish handset pursuits, Porsche has decided to get into the computing business with the Porsche Design Book One. Announced during MWC 2017, Porsche and Microsoft have joined forces to build one of the slickest 2-in-1 laptops yet. Microsoft must be mighty proud of whatever it’s got lined up with the Surface Book 2 to help this design behemoth craft such a gorgeous device – because boy, is it a sight. 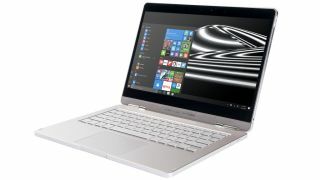 The Book One is a 13.3-inch, 15.8mm-thin device inside a milled aluminum housing with a matte anodized surface finish and a hinge designed in the same vein as Porsche’s approach to designing a transmission for a sports car. Not only does the hinge allow the device to rotate 360 degrees, but detach from its keyboard base completely. Going for an unsurprising $2,495 (about £2,004, AU$3,250) when it launches in the US this April, the Book One comes packing Intel’s latest Core i7-7500U (Kaby Lake) processor at 3.5GHz, backed by 16GB of RAM and 512GB of Intel-brand, PCIe solid-state storage. All of this rests behind a 13.3-inch QHD+ (3,200 x 1,800) touch display with inter-plane switching (IPS) for wider viewing angles. Backing up that awfully stark asking price are two USB-C ports, two more standard USB 3.0 ports, one Thunderbolt 3 (USB-C) port and a 5MP infrared webcam for Windows Hello login through Windows 10 Pro. At the very least, Porsche is offering a completely current system in terms of substance and style. The Book One appears to be aimed at a similar crowd to that of the Surface Book: creative professionals or just creative types with cash to spare for their work or hobby of choice. The sharp, well-backlit keyboard and Porsche-designed, magnetized stylus help give that much away. Not only does this mark a first computer from Porsche, but an all-new product category for the design firm. So, perhaps there will be more where this came from. But – one thing at a time – we’ll get to reviewing this one first.